The kit is boxed with a photo of the finished model, a right way to give an idea of what you are buying. 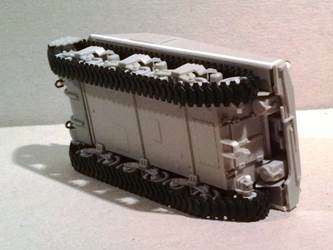 There are six light gray flash free mouldings: the bogies with the wheels (both types!) named A, the upper hull named D, the turret named E, the lower hull (with no letter) and a second suspension set named T2, each individually packed. This last one is a “quick building” single piece set with the open spokes wheels. The kit also comes with two black soft plastic T48 tracks and the decals. The mouldings also give us two jerry cans, two wooden boxes, two drum cans and two nice MG (a 0.30 and a 0.50). 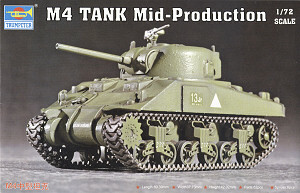 The M4 Sherman type proposed is the early - mid production (March 1943-July 1943), with the bolted transmission cover, the M34A1 gun mount and the pistol port/appliqué armor turret, as built by the American Locomotive Company. The Pullman Standard hull was identical, but had a different antenna bracket type. It can also easily be converted into a PSC tank. Aside the always welcome personal items, strangely enough the cast maker forgot to make the characteristic brush guards on the glacis. Sadly, the kit upper hull has the glacis at too big an angle, stretching it and pushing backward the whole deck (see the preview). To avoid a hull that would be much too long, the rear was cut a little more of a millimetre short; the effect is a deformed upper hull. Supposedly, this makes the kit unsuitable out of the box. Thank to the preview I was aware of the problem, however, surfing on the net I found this post where the author said that the upper hull could be corrected, I followed this tip and bought the kit. 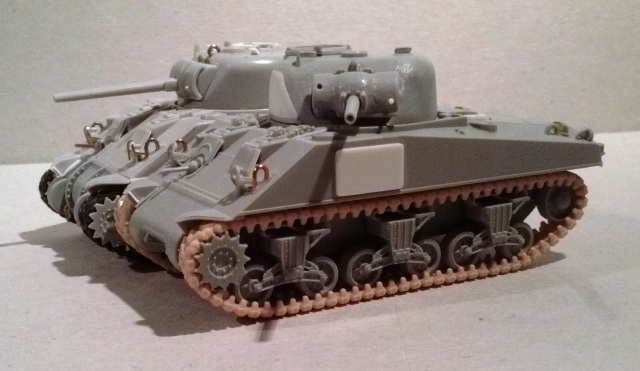 As a 3D reference I used a Dragon M4 together with the usual sources (Hunnicut book and the Sherman Minutia website). The thing worked and at the end I bought two other kits. The work is not as difficult as it looks. I scribed the inner upper hull side joints until the sides were detached from the glacis plate. I cut the sides to have a 68 mm long side, measured on the lower edge. From this new length the forward sloped edge was restored at the correct glacis angle. The glacis plate was folded downward and the sides were glued to the new forward side edges. The upper hull plastic is thin and this means less plastic to cut but also a weak gluing line, so every new joint was stiffened with sprue pieces glued inside with a generous amount of cyanoacrylate. The lower glacis edge was trimmed to size, carefully cutting off the fenders. I trimmed the inner back plate to free the passage of the exhausts. The exhausts were detailed, adding the two pipes and filling the two holes. I glued two sprue segments inside, flush to the lower edge. It helped to find the correct alignment when the two halves were glued, giving a support between the upper hull sides and the horizontal plates of the lower hull. I erased the rear lights and with 1.0 x 1.0 mm rod the hull rear was stretched. Then I glued the rear plate. Its upper edge was kept aligned with the engine deck, while its lower edge overhangs the lower edge of the sides by a millimetre. This is correct for an ALCO or a Pullman tank, for a PSC tank file the shim part vertically, keeping the kit lower side edge corner as a reference. I glued a 1.0 x 1.0 mm rod along each lower edge of the upper hull sides leaving it a little raised outside; this restored the height and added the missing sand skirt support. I heightened the lower hull rear plate D1 gluing a 1.0 x 1.0 mm rod piece on the upper edge. Before gluing the hull halves I had to replace the transmission cover: it is wrong, not only because it is missing the bolts, its curved plate has a wrong radius. For my tanks I used a cast one (an Italeri part converted in a rounded type) and two bolted ones (one from Dragon and one from Heller). Before removing it I used the kit part to mark the points as a reference for the correct alignment of the upper hull. The thin welding seam around the bow antenna bracket is correct for the ALCO produced tanks while a larger seam is needed for a PSC tank. 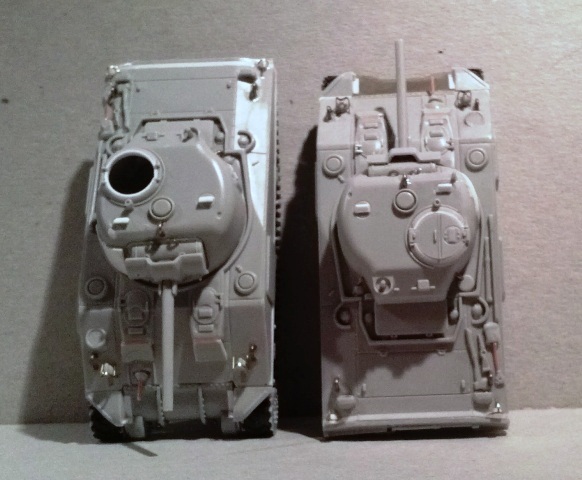 For Pullman tanks a wide cast base is needed (see the antenna bracket of the Armourfast M4); the detailing is a bit complicated, being solid with the glacis and for one of my three Trumpeter M4, which reproduces a Pullman tank, I chose to ignore it. The lights were added in the new position together with the new lifting points made with metallic wire (also the rear ones). I added the light brush guards, missing in the kit, with Dragon PE spare parts or by scratch building. The hood appliqué armor was made from 0.25 mm plasticard. Their shapes were also modified, making the inner sides vertical. The huge welding seams were also added with stretched sprue and cyanoacrylate glue. The glacis siren with its guard was scratch built with a rod section shaped like an egg. This is not shown in the photo as it interferes with the bow star marking. It will be glued after the decal has dried. The fender siren didn’t have the guard. The engine air intake cover D2 was a cast piece; with sand paper I rounded the corners. The shovel handle was erased and a new one was made with stretched sprue, after having removed as much plastic as possible under the shovel. New scratch built rear lights were added with spare Dragon PE light brush guards or by scratch building. The towing hook is upside down. I removed the hook base and a new one was made with two plastic strips. The interlock on the hull plate was filled. Each track tensioner received a 1.0 mm long piece of 1.20 mm diameter plastic rod (I know, it should be hexagonal…). The four towing eyes were made with metallic wire. The 1 ½ (or 1 ¾) inch appliqué armour is moulded on the turret side. It looks a bit thin; I thickened it with thin plastic card. 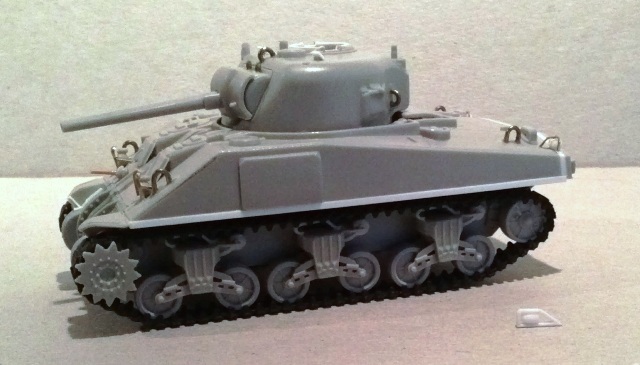 On one of my M4 tanks the turret received a cast-in armor and its pistol port was consequently removed. The hole for the smoke grenade was used by November 1943 when only Baldwin was still producing the 56° glacis welded hull. For my tanks I filled the hole with a drop of cyanoacrylate glue. The lifting points were made with new with metallic wire. The mantlet is a bit tall. I removed plastic from above and from the bottom (see the photos on the Sherman Minutia website). The hatch ring hole is a millimetre too wide while the external diameter is correct, making the ring section tight. I know, it is only a millimetre but it is really visible! I added a 0.5 x 1.0 mm plastic strip into the hole to reduce it by a full millimetre. The hatches were reduced in consequence, sanding away the plastic outside the little external gap. The aiming blade was thinned. The periscopes received the covers which I made with 1.5 x 0.5 mm plastic strip. The bogies are well done (strangely, the solid quick building pieces look better made then the other ones). The return rollers anyway are a millimetre larger (on both types provided). I erased and changed them with 2.50 mm diameter rod segments, taken from the T2 sprue which has the right diameter. The wheels sets are really good and the one you don’t use will be really useful for other projects. The sprockets (two sets) are well done, but a slice of plasticard was added between the toothed disks on the forward side of the hub, where the inner side of the tracks can lie. This job is needed to avoid the warping of the tracks which are really soft. 6th AD “HELL WITH IT”: I’ve seen it only in two photos, taken in Germany in April 1945. It had the appliqué armor/pistol port turret, but the cast transmission cover is not visible and I can’t confirm it had the bolted type (anyway other 6th AD tanks had it so it could be correct). The serial and the antenna bracket aren’t visible, but the rear upper plate is sloped, according to the kit. The bumper codes 6Δ68Δ and HQ-13 are missing. 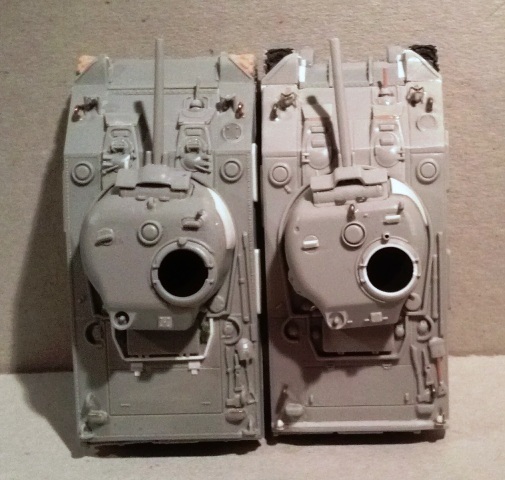 The decal set provides markings for two other tanks, not included in the instructions. 4th AD 8th TB serial 3039798 in Normandy. It could be a Pullman Standard M4. I say “it could” and not “it was” because I’ve seen this tank only in colour profiles and not in a photo so I’m not able to confirm if the serial is correct (but I think it isn’t, looking a bit too high, 3039178 could be more appropriate, being a July 1943 tank if my counts are correct). Looking at the proposed serial, it should have had the cast transmission cover and the cast-in armor turret with no pistol port, being higher than 3039595 (the higher Pullman serial I’ve found) which already had them. The 8th TB tanks had a dry mud or similar colour paint stripes camouflage. The 3rd platoon vertical stripes were carried on the hull sides, just forward of the serial (which looks a little too small), and on the shutter of the rear engine hatch. They have to be applied before the camo stripes for a better result. The bumper codes 4Δ8Δ and company-tank are missing. 754th TB C-2 “DRAGON LADY” in Luzon, Philippines, February 1945. It was a late production Pullman Standard tank, with the cast rounded cover and the cast-in armour/no pistol port turret. The siren was placed on the glacis with the late type guard (the type you can find on the 47° glacis tanks). 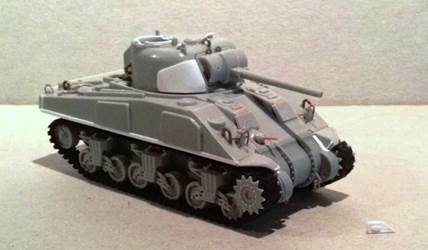 Out of the box the kit is useful only for wargaming. Upper hull and transmission cover apart, what remains is a good kit and some interesting spare parts. Not as good as the Dragon or the Heller kits, it is still useful with a bit of elbow grease, the only missing parts being the light brushes. An option to use the kit can be the upper hull replacement with another one taken from an aftermarket set or from a quick building kit (and it can be used also for a M4A1).